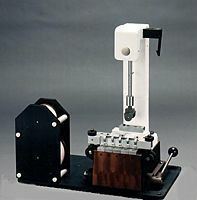 TT2100 Series Tensile Testers can show realtime force and elongation on a computer monitor as the force and elongation values change. The TT2100 series was designed to determine tensile strength and elongation for most materials and components. These testers offer accurate and reliable test results for production, quality assurance, and research needs. A wide range of testing capabilities are possible including tensile, elongation, compression, shear, peel, flexural, and proof of load for most materials and components. The TT2100 can replace many specific testers and computerize the data-acquisition functions. The mold must produce an imperfection free sample of uniform specified thickness. The die must cut a specimen for testing that will be the specified shape within dimensional tolerances (including thickness) as indicated for the test in question. 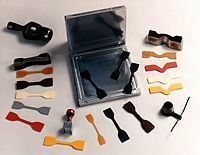 Dies can be supplied with mallet handle for fast, easy hand stamping of test specimens using a maul, or for use in clicker presses. Special press adaptors can be produced upon request.